In this coding exercise, you will learn about CPT coding for multiple E/M services with the use of modifier 25, as well as CPT/HCPCS and ICD-10 codes related to rheumatoid arthritis and a joint injection. Question: A 51-year old female patient is seen for a follow-up visit for her seronegative rheumatoid arthritis that is affecting multiple sites. There is no organ or systems involvement. The physician performed a detailed history and examination, and the medical decision making was of moderate complexity. During the encounter, the patient complained of swelling in the right knee with throbbing knee pain. She states her pain is a 9 on a 10-point scale and her pain has gotten gradually worse over the past five weeks. Ibuprofen has not relieved the pain. The musculoskeletal exam is normal except for the right knee, which is tender to the touch and swollen. Patient is taking sulfasalazine 500 mg tablets by mouth, 3 times a day. Along with the severe pain in the right knee, the knee lacks 5 degrees of full extension, and the range of motion is less than 45 degrees. Her gait is unstable, and she leans to the right side. Secondary osteoarthritis is suspected, and an x-ray is ordered to confirm the diagnosis. Patient elects to have a knee joint injection for the pain, and 80 mg of methylprednisolone acetate is administered via ultrasound guidance due to the patient’s weight of 300 pounds. A permanent recording of the ultrasound guidance is entered in the patient’s record. The patient was also given a prescription for the pain and is to return in four weeks. What CPT and ICD-10-CM codes should be reported? The patient is being seen for a follow-up visit for the seronegative rheumatoid arthritis affecting multiple sites, but with no organ or systems involvement. This is an established patient since it is a follow-up visit. Looking in the CPT coding manual Index under the Evaluation and Management, Office and Other Outpatient 99201-99215. Verified in the Tabular, CPT 99214 is the appropriate code. 99214 – Office or other outpatient visit for the evaluation and management of an established patient, which requires at least 2 of these 3 key components: A detailed history; A detailed examination; Medical decision making of moderate complexity. Counseling and/or coordination of care with other physicians, other qualified health care professionals, or agencies are provided consistent with the nature of the problem(s) and the patient’s and/or family’s needs. Usually, the presenting problem(s) are of moderate to high severity. Typically, 25 minutes are spent face-to-face with the patient and/or family. We know CPT 99214 is correct, because the documentation states “detailed history and examination, and the medical decision making was of moderate complexity.” Although only 2 of the 3 components need to be met to report 99214, 3 of the 3 components were met in this case. A new problem was assessed and treated during the follow-up visit, which was the right knee pain. This supports the need for a separate E/M code, according to AAPC. Therefore, Modifier 25 should be added to CPT code 99214 (99214-25) to indicate a significant, separately identifiable evaluation and management [E/M] service was performed by the same physician on the same day of the procedure or other service. This new problem is significant in that it requires treatment and a return visit. An injection of methylprednisolone acetate was administered in the patient’s knee joint. This procedure is referred to as an arthrocentesis, or joint aspiration, and the purpose is to obtain fluid for lab testing, or to relieve the joint pain and pressure, or both. This procedure is reported with CPT 20611. 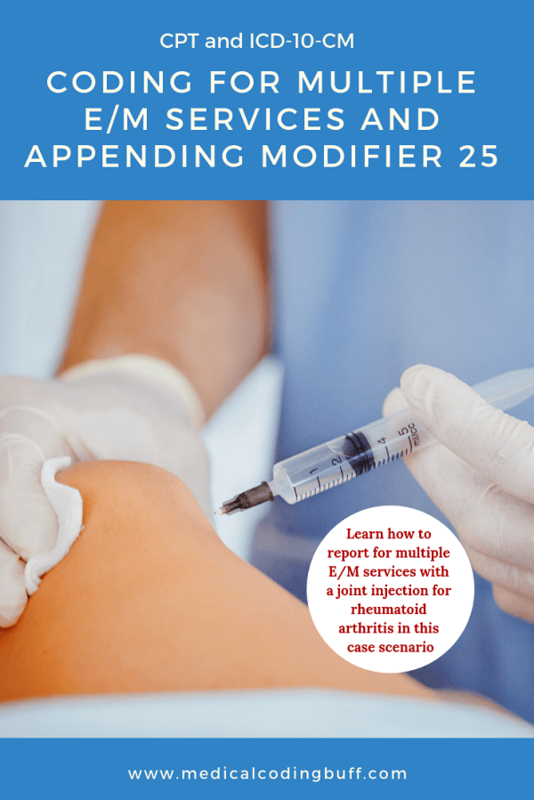 Because the injection was administered on the right knee, the modifier -RT must be appended to CPT 20611, making it 20611-RT. CPT code 20611 can be found in the CPT coding manual Index under Injection, Joint 20600, 20604-20606, 20610, 20611. In the Tabular, 20611 refers to Arthrocentesis, aspiration and/or injection, major joint or bursa (eg, shoulder, hip, knee, subacromial bursa); with ultrasound guidance, with permanent recording and reporting. The drug itself, methylprednisolone acetate, needs to be reported. Looking in the HCPCS coding manual Index under Services, Supplies, Equipment, and Drugs, see Methylprednilosone, acetate J1020-J1040. In the Tabular under Drugs Administered Other Than Oral Method, J1040 refers to Injection, methylprednisolone acetate, 80 mg. Patient has seronegative rheumatoid arthritis of multiple sites without organ or systems involvement and should be reported with M06.09 – Rheumatoid arthritis without rheumatoid factor of multiple sites without organ or systems involvement. This code can be found in the ICD-10-CM coding manual Index under Arthritis, rheumatoid, seronegative, multiple sites M06.09. This can be verified in the Tabular. The secondary osteoarthritis has NOT been confirmed because the physician does not have the radiology report yet. Therefore, the pain should be reported. In the ICD-10-CM coding manual Index, see Pain, joint, knee M25.56. Verified in the Tabular, M25.561 refers to Pain in right knee.